Question: How can you get your PAG-IBIG MID No. with your RTN No? This is in response to successfully getting MID no. after I had finished processing my PAG-IBIG multi-purpose loan. The PAG-BIG office texted me. The same as yours, the sms texts that you have had received in your phone is something like "Hi YOUR NAME You have been issued Pag-IBIG Mid No. based on RTN ********Number dated example "10/15/2014". To receive your MID no., text IDSTAT [RTN] [Birthdate](MM/DD/YYYY0 and send to "cell number". For more info call 7244244. First of all, allow me to give the acronyms of the above and what does it mean. Now, you have already know the meaning given above. It's time for us to give the details and simple instructions on how to Pag-ibig MID number with your RTN noumber given. 1. As you received the acknowledgment of your registration, you will receive a Registration Tracking No. on your cell phone or via email. 2. Keep your Registration Tracking No. 3. After 1 day or 2 days, go to pagibigfund.gov.ph again. 6. Enter your Registration Tracking No. 9. Copy your Pag-ibig MID No. That's it on how you get your Pag-big MID number after receiving texts from Pag-ibig instrcuting on how to get. Happy getting your MID number and inform others. 8. You will see the ONLINE REGISTRATION form. Fill up the form. Try your best to enter data correctly. But now, you can correct your data online. Here's some quick schemes on how you can get your PAG-IBI MID number. This is what I did so that I could print my MDF(if you are already a member). 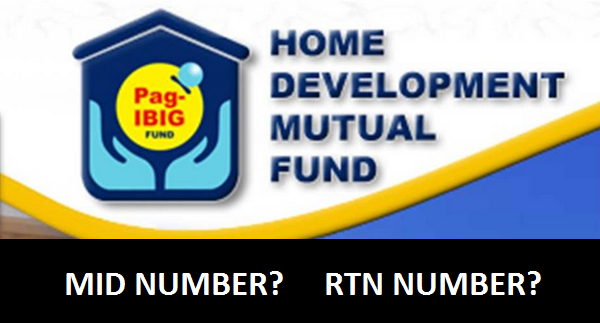 This post is under getting Your Pag-ibig MID No, RTN number only, Pag-Ibig Membership Identification Number Application, Pag-IBIG Membership ID number, how to get mid number and rtn number, SSS Number and TIN Number, My Pag Ibig Number In My MDF Form, The Only Present There Is My RTN Number, Pag-ibig number and/or RTN, so if you have questions and comments please comment through facebook or disqus comment.